Glycolysis is the process in cell metabolism by which carbohydrates and sugars, especially glucose, are broken down, producing ATP and pyruvic acid. It is a metabolic pathway which is almost universally followed by living organisms to convert glucose into pyruvate. from that point onwards, fate of pyruvate depends upon the organism and an active muscle,it becomes lactic acid;in yeast it becomes ethylalcohol.In aerobic organisms like us,pyruvate braks down to carbon dioxide and water via citric acid cycle and electron transport chain. Glycolysis is a determined sequence of ten enzyme-catalyzed reactions. The intermediates provide entry points to glycolysis. It is the foundation of both aerobic and anaerobic cellular respiration. It takes place in the cytosol of a cell and is the foundation of both aerobic and anaerobic cellular respiration. 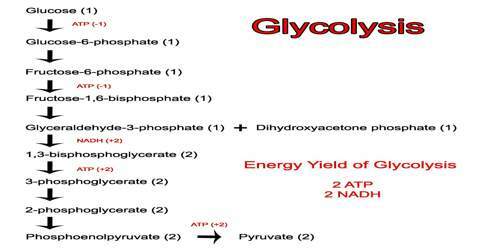 Glycolysis is breakdown of glucose in a 10 step pathway. The pathwya itself is termed as Glycolysis. Glucose, which is a 6 carbon sugar, is broken down into a two, 3 carbon pyruvic acid molecules. However, the real process is much more complicated and can be separated into two broad phases: the energy-requiring phase and the energy-releasing phase. Glycolysis occurs in most organisms in the cytosol of the cell. The most common type of glycolysis is the Embden–Meyerhof–Parnas (EMP pathway), which was discovered by Gustav Embden, Otto Meyerhof, and Jakub Karol Parnas. Glycolysis also refers to other pathways, such as the Entner–Doudoroff pathway and various heterofermentative and homofermentative pathways. However, the discussion here will be limited to the Embden–Meyerhof–Parnas pathway. 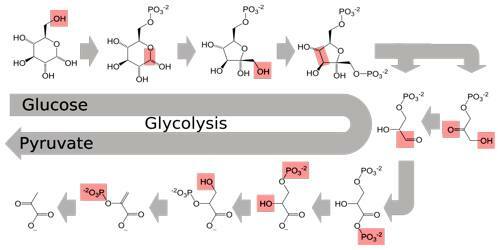 The pathway of glycolysis as it is known today took almost 100 years to fully discover. The combined results of many smaller experiments were required in order to understand the pathway as a whole. The glycolytic pathway is nearly ubiquitous, being found in every cell of virtually all living creatures. It is catalyzed by soluble enzymes located in the cytosol of cells. Although the glycolytic pathway is most commonly thought of as metabolizing glucose, other common monosaccharides such as fructose, galactose, and mannose are also metabolized by it. The glycolytic pathway operates in both the presence (aerobic) or absence of oxygen (anaerobic). In glycolysis, glucose is the fuel molecule being oxidized. As the glucose is oxidized by the glycolytic enzymes, the coenzyme nicotinamide adenine dinucleotide (NAD+) is converted from it’s oxidized to reduced form (NAD+ to NADH). When oxygen is available (aerobic conditions), mitochondria in the cell can reoxidize to NADH to NAD+. However, if either oxygen levels are insufficient (anaerobic conditions) or mitochondrial activity is absent, NADH must be reoxidized by the cell using some other mechanism. Glycolysis has two basic functions in the cell. First, it metabolizes simple six-carbon sugars to smaller three-carbon compounds that are then either fully metabolized by the mitochondria to produce carbon dioxide and a large amount of ATP or used for the synthesis of fat for storage. Second, glycolysis functions to produce a small amount of ATP, which is essential for some cells solely dependent on that pathway for the generation of energy. 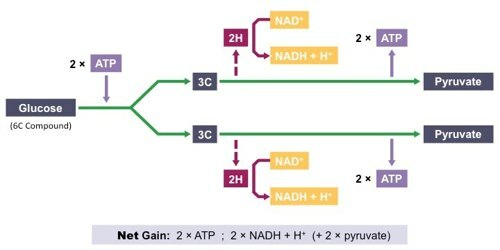 When both the energy-requiring and energy-releasing phase of glycolysis have occurred, the products of the overall reaction include two pyruvate molecules, two ATP molecules, and two NADH molecules. 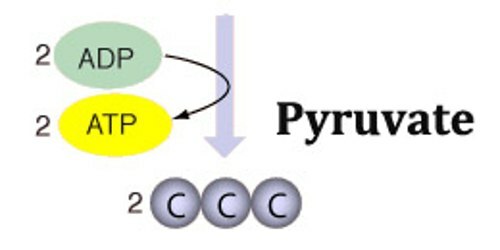 In the presence of oxygen, the pyruvate molecules can be broken down via oxidation in cellular respiration to form more energy in the form of ATP and carbon dioxide. The NADH molecules cycle back and forth between the oxidized and reduce states (NAD+ and NADH).